The game of golf has ruined the weekends of enthusiastic amateurs for decades – so no wonder there are scores of top golf watches, swing analysers and wearables that promise to unlock the secrets of those dropped shots, double bogeys and sliced tee shots. Game Golf ($179) is one such device, and promises unprecedented levels of insight into your game. It's a small box that clips onto your belt, with a bunch of sensors that screw into that mystery hole in the top of your grip. Just tap before every shot to create the ultimate scorecard, that will enable you to become a better golfer. Simple right? What's more, the second generation dubbed Game Golf LIVE, has added a smartphone link for real time information out in the course – a big omission from the original. 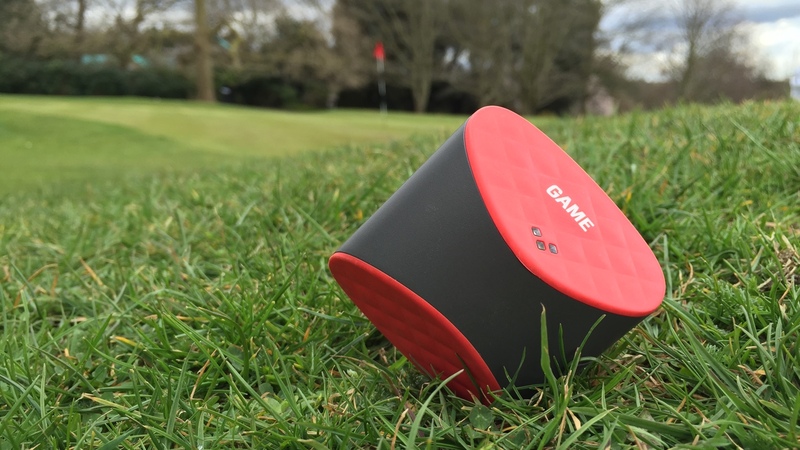 The premise is simple, and there's not a lot of functionality involved with GameGolf. Clip the unit on, set out on your round and turn it on. Then, on the first tee, tap the sensor of your chosen club on the underside of the belt-worn unit, and wait for the beep. Now take your shot, and repeat. It features built-in GPS that logs the exact position of every shot, the club used, and where it lands – based on the position of your next shot. It features the details of over 40,000 courses worldwide. When you get home, you plug GameGolf into your PC or Mac, and set up an online account. Your rounds will be uploaded and deciphered, and information presented. GameGolf will then show you a complete scorecard of your round, as well as number of putts, average putts per hole and the position of every shot. It will then also give you information on your fairways in regulation, greens in regulation and accuracy and distance of every club. As you build up rounds, you can also look at your club performance over long periods of time, the amount of fairways you hit and the average distances of each of the clubs in your bag. There are a host of missing features, that seem like obvious omissions, however. The partner iPhone app adds little to the experience, when it could be used as a live scorecard for your round, and despite knowing where you are on the course, the system doesn't tell you distances from the pin – which means wearing a GPS golf watch as well. The headline changes to the second generation Game Golf are the live features, which can be accessed during your round. The main problem with the original Game Golf was that the device was fully focussed on reporting your round after the event, but was completely useless at the business end – when you're staring at the green, wondering how to make the shot. Now you can fire up the app mid-round, and it acts as a rangefinder and scorecard. It also enables you to look back at all your shots, which are plotted on maps of the holes. However, it's hardly a GPS watch beating experience. The maps are nice looking, but it's a pain to pull out your phone every time you want to check distances. What's more, the interface is cluttered with your previous shots, yet doesn't offer much help – it could suggest the correct club based on your averages, or notes on how to play the hole. But it's lacking. One of the main positives about GameGolf is how easy it is to use. The set up is easy and it's bulletproof out on the course. You tap, it records. There are no worries about telling it where you are, or what hole you're on – which makes it joyously simple to use. The only problem is remembering to tap. The first time we took it out, we diligently tapped in on every shot – for the first eight holes. Then things got seriously patchy. It tended to be easy on the tee box, and as the shots got harder and you got frustrated with your game, tapping went out of the window, especially on the greens. You have to be serious about tapping, and build it into your pre-shot routine. The result, psychologically, can be good and bad. The act of tapping is a good way to start thinking about your shots, and helps you to concentrate. But when the going gets tough, tapping in a shanked shot just adds insult to injury. Of course, missing taps will ensure you return to the clubhouse with a patchy scorecard – and we regularly found ourselves running back to the scene of shots or putts to tap in, after the event – it started to become a burden. You can add in missed shots when you get home to complete your scorecard, and manually change incorrectly tagged shots to maintain a complete card – if you have a good memory. Once you finish a round and you review your card, GameGolf can feel a little disappointing. It felt like hard work to get the scorecard complete, and apart from it telling us two things we already knew – that our round stank and we missed way too many putts – there wasn't that much to learn. The scorecard also lacks some functionality we also felt was quite basic. There was no way to calculate a Stableford score quickly, and GameGolf doesn't really take into account your handicap – in reality or aspirationally – so it doesn't feel like you're working towards anything. There's also a lack of analysis. We'd like it if it told us something useful: "Work on your tee-shot accuracy" or "stop using that damn 6-iron" but it doesn't. The end of your first few rounds feels like hard work for little gain. However, there are positive long-term effects of sticking with GameGolf. However, when you stop thinking of GameGolf as a round-tracker, and more of a career tracker, it becomes more useful. Quietly, the system is tracking every club's performance, so after you've played a year's worth of golf, you can pull up every drive and look at your accuracy. You can see if you're more accurate in September than you were in March, or whether your putting has improved. What's more, you can look at your irons and their average distances. Everyone knows a 140 yard shot requires a 7-iron, but what if you tend to hit that 130 yards? Or 150? Over time, you can learn useful information about your shots, and that's worth its weight in gold. And when you start thinking about GameGolf's long term benefits, it's actually not so bad if you forget to tap in, because the most useful information isn't about today's round, it's about your game in general. By its very design, GameGolf requires a lot of effort and often doesn't deliver an equivalent level of insight. There are obvious oversights, and we feel there are scores of useful features just begging to be added. However, over time, the system has the capability to actually take shots off your handicap, but it requires perseverance and patience – much like golf itself.